It's been 4 years of waiting and this sequel didn't get me down at all! I really love animation movie, especially when it has unusual problem like this franchise. How to Train Your Dragon (2010) successfully give me the best feeling for being a fangirl of children movie, somehow it brought back my childhood memories, no, I didn't have dragon, I swear. I love how Dreamworks played with the viewers feelings because I cried during the movie - actually I always cry every time I watch movie I don't know why. I think, it's a hard job to make a sequel for a successful movie. It becomes harder when the first one is a great movie. 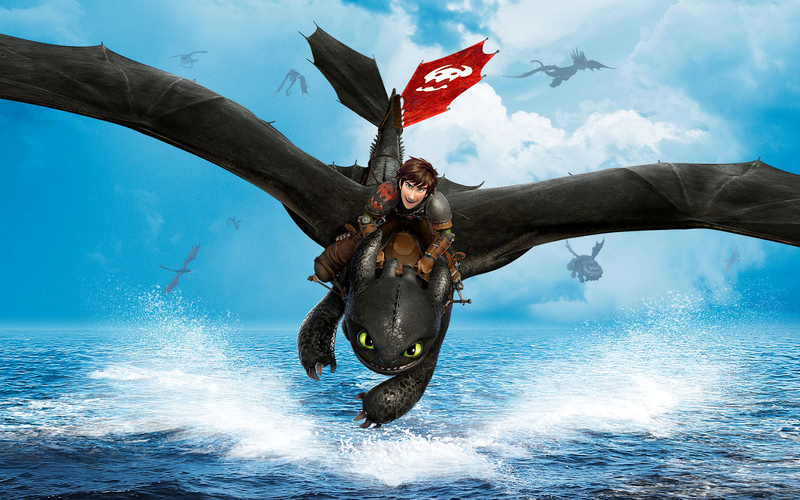 How to Train Your Dragon is one of the best animation movie ever made and it's one of my all-time favorites. This sequel, How to Train Your Dragon 2 repeating history in order to get me really emotional too sensitive - I cried a lot, I laugh and even upset. I mean, helloooo, this is an animation movie, it's a kids movie - but you know, the second movie is slightly darker than the first one. The problems are more complicated yet hard to solve almost impossible because they brought animal's nature instinct or something like that, following the leader, the alpha. As much as I love the first movie, I can say that this sequel is much better. Hiccup (Jay Baruchel) is 20 now and he was forced to be a chief by his Dad by he's not Hiccup if he just agreed, he runaway - travelling - with his best friend, Toothless, and finds a problem, where a villain, Drago (Djimon Hounsou), Stoick's (Gerard Butler) frenemy, made a Dragon army to rule the world. the script is a great example of how to write a sequel, drawing upon what made the first film great at the same time as adding plenty of new ideas. It is a massive improvement to the first one, because it has better 3D animation effects (which again are not over the top) and the story in this one is not just for kids and teenagers. The animation and visuals are probably the best I've seen from any CGI film to date. It is just breathtakingly amazing. The character's movements are so fluid and each character has their own way of moving. Both 3D Animated effects and story go well together in the correct proportions, the director, Dean DeBlois got it absolutely right. The characters and voice actors are perfect! I love how the characters have grown and their personalities have been enhanced. Hiccup takes a more proactive role in this film and we really see that he's matured a lot from the first film. His and Toothless' relationship is expanded on and it really is still the core emotional center of the film. Drago is a fantastic villain and is really a cold hearted murderer. His method of mastering dragons really differs from Hiccups and its a great contrast that shows the different types of people that are in this world. I love how they build him up before actually revealing him. I love how Hiccup Mom's, Valka (Cate Blanchett) is back but sadly, Stoick died. It's emotional moment and this movie get more emotional when the one who killed Stoick was an evil Toothless. The music score from John Powell impresses is a perfection! It's bombastic, epic, touching, and moving. There is something about the score that really makes the film so much better than it already is. I was literally in tears a lot because of the score and the story made a great combination. I hope there'll be the third movie!